Sometimes I run into this question when writing scenes in my fantasy novels: where do the people cook? And how is it done? The kitchen–a room built for the purpose of cooking–is a relatively recent invention. So where have people cooked throughout history? The ancient Greeks had no dedicated kitchen but moved their cooking devices (such as portable ovens) and utensils from room to room. The ancient Anglo-Saxons cooked outdoors, especially during the summer. In the Middle Ages in Europe, houses generally had a fixed hearth for cooking, but since most homes were one-room dwellings, the room with the hearth wasn’t just the kitchen, but also the living room and bedroom. Wealthy households did have kitchens, but the kitchens weren’t attached to the house. They were separate buildings, probably to minimize the risk of a fire spreading from the kitchen to the main house. 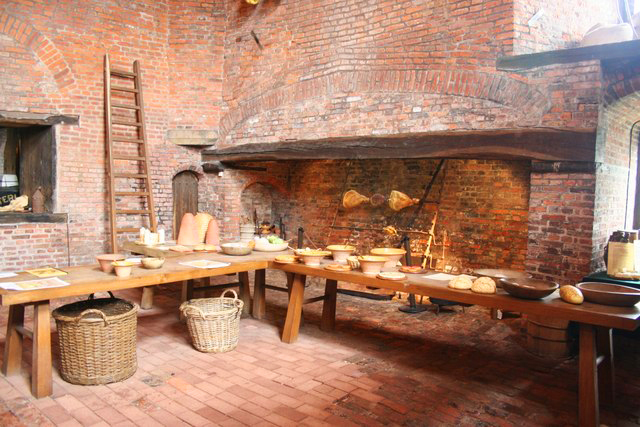 In the Renaissance era (where most historical romances are set), wealthy homes would have not a single kitchen, but several rooms dedicated to various types of food storage and preparation. These could include any or all of the following: a dry larder for storing foods like bread, butter, and milk that needed to be kept cool and dry; a wet larder for raw meat and vegetables; a game larder; a dairy; a bakehouse with a brick oven; a smokehouse; a salting room; a pastry room for making pies and tarts; a scullery; and the kitchen itself, where the cooking took place. The scullery was the least desirable place to work because it was where all the least pleasant jobs were done, including preparation of ingredients before cooking, and cleaning up with the wash water from a large copper boiler. Because all the dirty work happened in the scullery, the kitchen itself was pleasant. But only the ridiculously wealthy families enjoyed this kind of setup. The modern concept of a kitchen as a single separate room within a middle-class home, designed specifically for cooking, did not emerge until the 20th century. 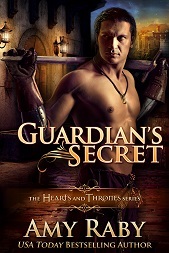 This entry was posted in Fantasy, History, Writing and tagged fantasy, history, kitchen. Bookmark the permalink. I love the photo. I think the idea of a central hearth used for cooking and warmth is so romantic. But I’m sure glad I don’t have to turn a spit to cook dinner or boil water over open flames. I love my electric stove and oven.